Well, I guess now that I have a website I might as well have a blog as well. I will try to keep things up to date as I get stuff done in the shop, with any luck, at least once a week. There will be a bunch of shop pictures, probably some drawings/doodles, some velosophy, and some current events. I have a couple of those already! First off, let me introduce y'all to my shop. Currently I am working out of the Foundery (http://bmorefoundery.com) in Baltimore, MD. I have had a couple of little projects come to me through the shop- a separated dropout, some braze-ons for rack installation, a brake cable stop replacement, an experimental seat stay repair, and a home-brewed spoke carrier on a touring rig. If anyone in the Baltimore area has little frame repair or alteration jobs, drop me a line. my prototype u-lock integration on my own jalopy/basket bike. Fixing a dropout- note the structural toe-strap. My biggest project has been Ben's road/cross/commuter. Initially, Ben approached me asking to attach some disc mounts to his old Surly Cross-check. As we chatted about possibilities, it became clear that just starting from scratch was the way to go. The result is a modified cross bike- a mid trail road geometry with clearance for 35mm tires without fenders, 32 mm with fenders. The tubing is a mix of 9/6/9 and 8/5/8 Nova brand stuff, with stays sturdy enough for some light touring/commuting. It is fillet-brazed with a stainless Richard Sachs' Newvex seat lug and Paragon dropouts. 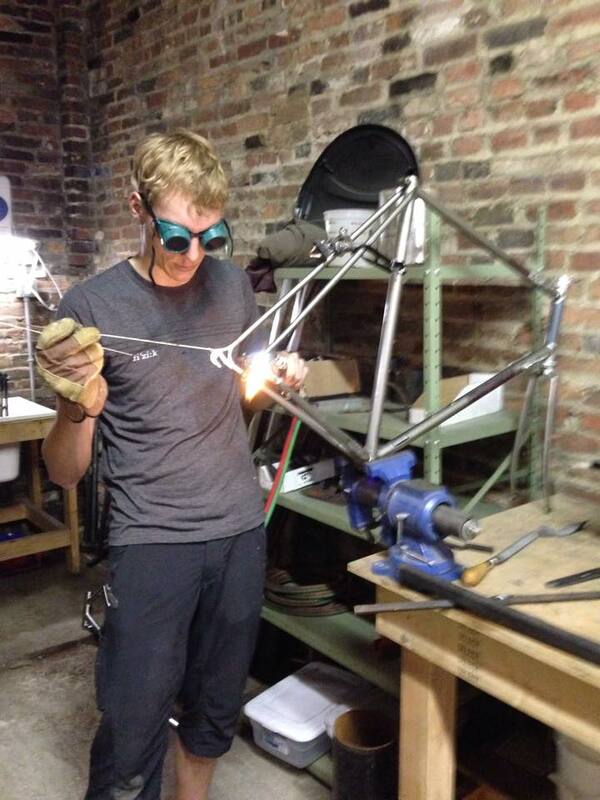 If Ben ever decides to do some cross racing, he could throw a carbon fork in there and it would be rad. I put the frame together at the Squarebuilt (http://www.squarebuilt.com) shop up in Brooklyn, where I had done some work earlier this year while living in Brooklyn. Lance is a wonderful human and has been a great teacher and help to me. Once I got the frame stuck together, I brought it back down to Baltimore, where i have since added a seat stay bridge and disc brake support strut. Once I wrap up the finish work in the next week or two here, it will go off to paint. Very exciting times indeed.